Today, we’re celebrating the 500th posting here, and what makes more sense than a $500 car to go with the theme? Poking around does not reveal many viable, interesting vehicles at that price – even 20-year-old beater cars seem to fetch more than that. 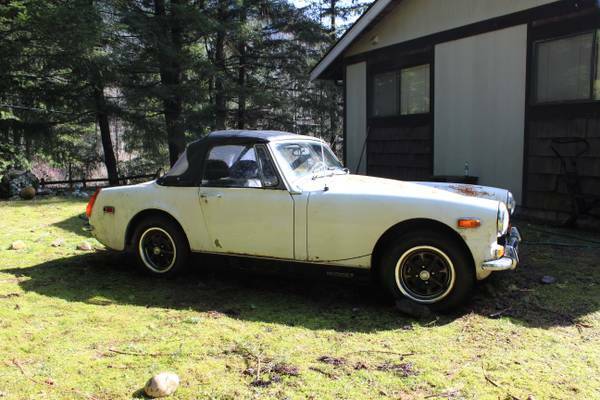 So finding a British classic for that price prompted a sigh of relief, almost – check out this 1972 MG Midget, for sale for $500 in Kendall, WA. 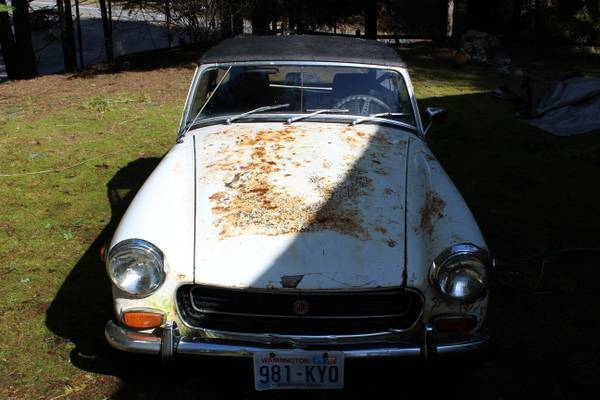 Yes, it’s seen better days, but there doesn’t appear to be any significant damage to the body outside of corrosion. And the western Washington climate has done its fair share to contribute to that, with plenty of surface rust, said to be from poor storage, and bubbling at the lower extremities of most panels. However, none of it looks like it’s broken through in a major way, so there’s some hope for structural solidity. Also on the bright side, the car’s stance looks stock, and it doesn’t seem to have been subjected to any modifications of questionable taste. The round rear wheel well, split rear bumper ’72s are most prized among enthusiasts of the type. Can the seats really be untorn? 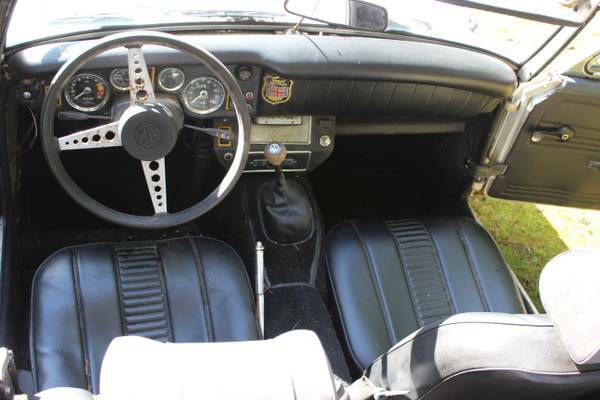 Carpet looks intact, there are no cracks in the dash, and that might even be an original radio at the bottom of the center console. Even the shift boot is present and intact. You’ll probably have to go through here and clean every electrical contact, but what were you expecting for $500? Hopefully this nice interior is not covering up big holes in the floor – the seller doesn’t mention any major corrosion damage. 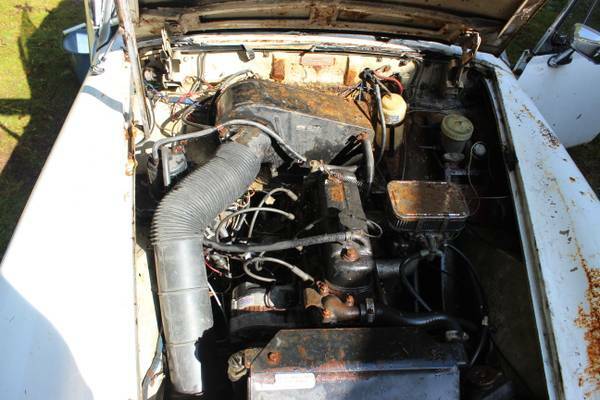 The engine compartment looks complete, and the car is currently fitted with a Weber carburetor. While this may or may not be to your taste, it does say that someone cared enough about this car to spend some money on it. It would be interesting to know from the seller why the car was put in storage – he does mention the car comes with many extras, whatever that means. As with the interior, you’ll probably have to spend some time cleaning contacts and probably replacing fluids, hoses, and hydraulics. Sweet! 3 wipers on the windshield is only beaten by the 2 rear wiper wackiness on mid-1990s Camry wagons. It looks like there’s some filler in the nose, so make sure there hasn’t been a major hit, although at this price, who cares? Sure, that’s a lot of surface rust, but if the car’s structurally solid, you can enjoy it for a couple of years and then sell on to another nut job who’s got a vat of Liquid Wrench and up-to-date tetanus shots, or even part it at a profit. This entry was posted on April 21, 2014 at 10:23 am and is filed under Feature. You can follow any responses to this entry through the RSS 2.0 feed. You can leave a response, or trackback from your own site. Seems a deal, but I couldn’t link the ad. I bought a similar Midget around 20 years ago for about the same coin (mine looked much better though). The rear spring perches were rotted and the fella’ I called to pick it up so he could fix it bought it from me for $1000 in the parking lot of the apartment complex the guy I bought from lived at. That was nice.. I did have to help him get in the trailer so the profit wasn’t completely effortless. Thanks for the catch! Link is now working. How do I perchase this vehicle!